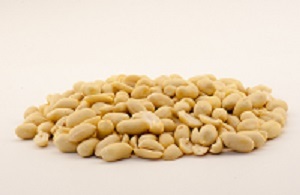 These Raw Virginia Peanuts are great for roasting or frying or for making candies in your own kitchen. WAKEFIELD PEANUT COMPANY PEANUTS ARE NOT GENETICALLY MODIFIED. Place Raw Peanuts, in shell or shelled, one layer deep in a shallow baking pan. Roast in a 350 degree oven - approximately 15-20 minutes for shelled peanuts and approximately 20-25 minutes for in-shell peanuts. Remove from heat just short of doneness desired as peanuts continue to cook as they cool. Season to taste. Times may vary with individual ovens. CAUTION! THE PAN AND PEANUTS ARE VERY HOT! * A copy of our booklet, "All About Cooking Peanuts", will be included with your order. Peanuts are the original "Health Nut." They contain B vitamins, protein, Vitamin E, fiber and essential minerals. They do not contain cholesterol! * Subject to bulk ship weight. 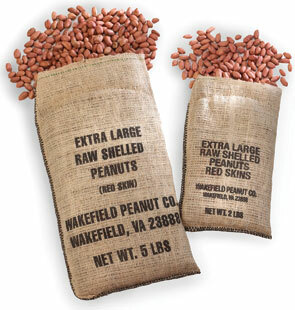 The same great Raw Virginia Peanuts as our Raw Redskin Peanuts, but with the skin already removed for you. 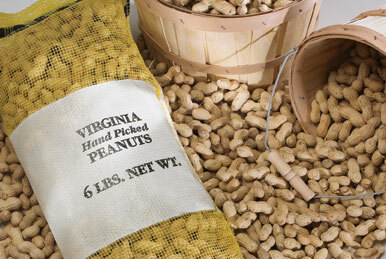 Our Raw Virginia Redskin Peanuts are grown by our local farmers and processed here at our plant. Great for you to use for your peanut brittle or any peanut recipe.